Posted on September 12, 2016 · TxDOT has now dramatically lowered the speed limit on a segment where drivers were accustomed to going a lot faster. Posted on January 26, 2012 · Texans are going to be seeing higher speed limits on some Texas highways. Some sections of interstate will soon have 75 mph speed limits. Posted on December 20, 2011 · Months after lawmakers approved the Texas Department of Transportation to up speed limits — work is finally being seen statewide. 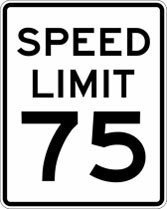 As of September 1st, the law says TxDot can create a 75 mile per hour speed limit on any highway where studies find it to be reasonable and safe. Posted on August 31, 2011 · Traveling Texas roads at nighttime might get you home a little bit faster. The state has been behind the times when it comes to speed limits, but that's all about to change as of today.